According to MarketWatch, a dedicated home office is becoming a must-have home feature for many new home buyers. While you’re not selling your property just yet, it is wise to consider this aspect when designing or remodeling your interior. As for the more current benefits, you will create a workspace that motivates you to be productive and meet your tasks timely. If you want to spruce up your work zone and increase the appeal and the value of your property (should you decide to list), here are some hints that will help you get the most out of it. It would be the best to have a separate room dedicated to work. This way you would never be distracted by kids running around the house, other occupants listening to music, people constantly asking questions, and so on. A separate room could also be the most appealing for house buyers, so think about the future. If that is not possible, you can create a nook where you’ll be able to store your work-related stuff and meet your duties. The nook should be visually separated from the rest of the room with area rugs and screen covers, but it should still blend seamlessly into the environment. Natural light indoors is one of the biggest design trends this year. Don’t allow your office to be devoid of this awesome perk. If you have the chance, install larger windows or skylights. Put your desk close to the windows and parallel to the panes to get the maximum of daylight without it going straight into your eyes. While the sun is an excellent choice of lighting, it still doesn’t provide you with enough illumination throughout the day. Adequate office lighting can be accomplished by layering artificial solutions which include ambience, task, and accent. The first one comes in the form of an overhead fixture, the second is a desk lamp, and the third can lit up architectural features, like built-in shelves. Have you heard the news? Sitting is the new smoking! And if you are sitting in an uncomfortable chair for hours, that makes things even worse. This is why executive chairs in Australia make an unavoidable part of every home office. This piece of furniture is always designed with ergonomics in mind. You should think beyond the chair, and also get a desk of appropriate height (the top of the computer screen needs to be at the eye level or slightly below). Use the vertical space by installing floating shelves or other storage solutions. Use storage boxes for office supplies. Tuck the office into an unused closet and use its upper shelves for storage. Hang items that can’t be stacked on a shelf. 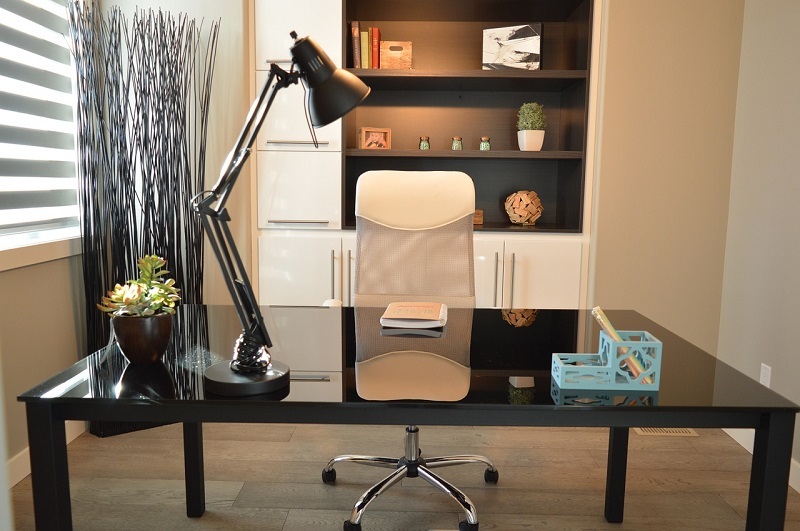 To move beyond the dullness of cubicles, you will need to enrich your home office with details that will create a more pleasant environment to work in. This can be accomplished with houseplants (besides looking beautiful, they are believed to improve your focus, mood, and the quality of air), artwork, family photos, motivational posters, rugs, and adding a comfy break zone (e.g. an armchair + an ottoman to put your legs up). All of these tips will help you create the ideal home office where you will be able to perform your very best. Furthermore, a workspace such as this is bound to score some points with potential house buyers, if you one day decide to list your property for sale.